I’ve been producing crosswords on the First World War poets for the last few years and worked feverishly to create some to commemorate the Armistice since this weekend is the centenary of that longed-for moment. Wilfred Owen is my particular favourite of those poets, with Sassoon a short step behind and it is difficult not to be moved by those words from Binyon’s The Fallen that we will br hearing in tomorrow’s services, ‘They shall grow not old, as we that are left grow old … at the going down of the sun and in the morning, we will remember’. MacCrae’s ‘In Flanders Fields’ and Brooke’s ‘If I should die …’ are classics, even if later attitudes have denigrated that early patriotism and optimism Brooke displayed. Jeremy Paxman, in Great Britain’s Great War, writes a most instructive analysis of how a century has adapted our attitude to those dreadful events of 1914 to 1918. So I was expecting a crossword in some way related to the centenary of the Armistice and we had solved for only a few minutes when those letters we were adding to across clues began to spell out I AM THE ENEMY YOU KILLED (my friend), possibly the most moving of all Owen’s poems, though the saddest must be Futility, and the most shocking Dulce Et Decorum Est, with its graphic reaction to a gas attack. For me, almost the saddest moment of the whole war was the doorbell ringing at Owen’s home to announce his death, as the Armistice bells celebrated the end of it all. Of course, finding the quotation from Strange Meeting made this a speedy solve for us, though we were puzzled by 1ac CO?F?CT, until we realised that this was the clue where the Escapee was coming into his own, ‘It seemed that out of battle I escaped …’ the first line of the poem. We removed I from CONFLICT and all was well. This was perhaps a precursor for the cryptic manipulations of 26 letters that were needed for the completion of our crossword. ‘A later work that features the first work (Strange Meeting) and others by the same author’… Friends are performing in Britten’s WAR REQUIEM this weekend and those misprints in down clues obligingly spelled out that title, so that we were able to interchange the letters of SLOB and WRITTEN producing OWEN and BRITTEN in the grid. All that was left to do was the highlighting of 26 letters. So we head scratch. ANTHEM FOR DOOMED YOUTH took longer. We could see that the ‘Doomed’ could be an anagram indicator but I had a bit of an issue with ANOTHERFMLAD* on the third row of the grid, as that anagrammed to ANTHEM FOR LAD, whilst the archives show very clearly that Owen and Sassoon, in their discussion of the title, were discussing ‘youth’ as a state of being or a collective term for all those lads, not just one lad. Of course, Dysart had foreseen this and ’26 letters’ made it clear what was required and those words in the preamble removed my worry ‘the titles of … two others used in the later work’. Yes, Britten’s script refers to A doomed youth, justifiably focusing, possibly on Owen. So we abandon poor EDISON and highlight the other three. What a fine tribute. Many thanks to Dysart. Colour-coded jumbles and clues where extra words appeared. We got down to our solve – well, after I had confirmed Dysart’s continued membership of the Listener Setters’ Toping Club: he didn’t leave much doubt did he? 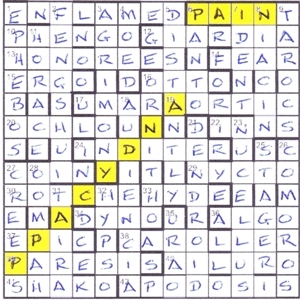 ‘Tipple from drink before travelling west (5)’ gave PINTA with the A (before) moving west in the clue to give PAINT. What has that to do with ‘tipple’? I was amazed to find that it is slang for tipple! A few clues further down we find ‘Spirits occasionally abandoned by judge in lodgings (4)’ There are not many J words in Chambers (Jack, Japan, Judge, Joint, Journal, Justice, Joule …) and a spirit that begins with J in JINN so we slotted INNS in without a second thought – well, we did have a second thought and allocated ‘occasionally’ to our list of extra words, giving ourselves trouble later when we were trying to work out what it was doing there. One has to be so careful: Chambers,of course, explains that JINNS in the plural is non-standard use. However, with that tipple, pinta, paint and spirits, I think Dysart keeps his place at the bar. Cheers! Solving proceeded steadily with these enjoyable clues and when DISTANTLY, OTTO and GIARDIA joined the PAINT in that right hand corner, we were able to establish that ON TAP (so Dysart is mixing the beer in!) was going to be one of the jumbles, and, what is more it resolved itself to a real word, PANTO, when AORTIC almost completed the corner. We were rather surprised when BEAR ‘Have to suffer ill-mannered chap (4)’ seemed to have a triple definition – luckily, we postponed our reflections about that word to the end – when it became so useful! The head scratching continued for far too long before the p.d.m. If we had just read those jumbles out loud, all would have been clear far earlier. There was a muttering about the title – how is it full of dread? AH, FEAR! The other Numpty was soon looking up OCHLOPHBIA, fear of crowds, AILUROPHOBIA, fear of cats, ALGOPHOBIA, fear of pain, ORNITHOPHOBIA, fear of birds, HYPSOPHOBIA, fear of heights, PANTOPHOBIA, fear of everything, PHENGOPHOBIA, fear of daylight and NICTOPHOBIA, fear of night. With a little research, we found that Andy Capp suffered from ERGOPHOBIA, fear of work. So that triple-clued BEAR had to become FEAR and all that was left to do was highlight the one phobia that didn’t have a corresponding word in the clues, algophobia, fear of PAIN. What a fine finish. Thank you Dysart. That elusive hare? I received grief-stricken comments about the possibility that he was dead and gone but, in fact, no need to worry, he really does seem to be on his hols (postcard arrived from the COMOROS, see 26d, where he is sunning himself on the beach, not suffering from MARAPHOBIA, see 17ac or LEPORIDAPHOBIA) and he’ll be back, one of these days in a straight line of four letters. Last year’s Dysart revolved around Edward Lear’s Jumblies with lots of (un)jumbling going on. 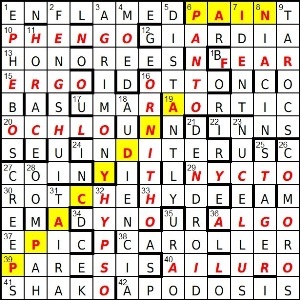 This week, we only had nine entries to be jumbled before entry, mostly resulting in non-words. Mostly!? Solving was relatively steady with some good entries going in, including FENG SHUI, ON TAP, OURIAL and CYTON. Unfortunately, most of them ended up having to be rubbed out and jumbled! It was only when ORNITHO was probably the entry going in the middle column — more likely than ORTINHO — that a quick check in Chambers showed that it signified ‘bird’. Well, I knew that, and having clocked the extra bird word in 21dn Tree-like object blocking road to the north, deserted apart from five birds (8) (END in RD< + VOID – V) that ORNITHOPHOBIA revealed that we were talking about fears of the irrational variety. Okay, HYPSOPHOBIA isn't too irrational, but you get my drift. The extra words and their phobias were: daylight/PHENGO, work/ERGO, crowds/OCHLO, night/NYCTO, pain/ALGO, cats/AILURO, everything/PANTO, birds/ORNITHO and heights/HYPSO. The only extra word that wasn’t an extra word was PAIN and that was part of the entry PAINT in the top row. Next we had to change BEAR at 14ac to FEAR, a synonym of PHOBIA, and lastly highlight a cartoon character noted for one of the thematic items. Fear of work seemed the likely phobia, and Homer Simpson was the first character to come to mind. He was nowhere to be found, but ANDY CAPP, Reg Smythe’s character in the Daily Mirror was there, running NE to SW. Thanks for a very entertaining puzzle, Dysart. Amazingly, it doesn’t seem that phobias have been used as a theme before, apart from the good old TRISKAIDEKAPHOBIA, fear of the number 13. Now I’m sorry, but that is irrational! We know that Dysart is likely to give us tricky but fair clues and this was no exception. The first line of his preamble had that word ‘unjumbled’ in it and we groaned. 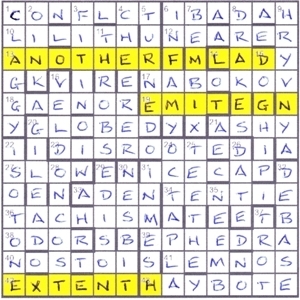 What was worse, we had to remove a letter from each of those ‘jumbles’ and those letters were going to spell out what we must do with thirteen across answers. I suspected at once that we were going to jumble those, as soon proved to be the case when we attempted to enter our first two solutions, NERITES and GEST. ‘Gastropods found in briny wreaths become prevalent across middle of area to the north (7)’. ‘wreaths’ clearly had to become ‘waters’ giving us an extra H and SET in< went round (a)RE(a). GEST came from ‘Old romance’s synopsis overlooking princess (5)’. This had to be DIGEST losing Di, but we had the intriguing situation that that had only four letters and the light gave us five. I immediately attempted to jumble GEST with an I in second place and came up with GITES or TIGES. Hmmm! Not all of those jumbles were quite so obvious and we delayed the penny drop moment for quite a while by guessing that ‘Mathesis? Short sermon inspires essence of work (8)’ was going to give us ‘Atheism’ with an extra S, and not, in fact ‘Messiah’ with a T. Thus our message would begin with SHE and not the THEY that we needed for THEY WENT TO SEA IN A SIEVE. It wasn’t until we had THONGS with an extra I going in as ON SIGHT (Footwear, no socks in those Chinese stores = ‘hose’ removed from T(hose) + HONGS) that we realized that OR?TOR?O had to be ORATORIO, which has a lot to do with ‘Messiah’ but not much with ‘atheism’. So we had that T of THEY. The grid was filling nicely and our initial guess that thirteen across clues had to be jumbled with an extra letter (which seemed like a really tough task) was going passably well, but having the first words of Edward Lear’s ‘Jumblies’ speeded things up enormously, especially when we realized that an I was being added to ‘jumbles’ to produce them, and that that same I was being added to all of those across jumbles. That explained the title, too. We were not looking for some pioneers from the start of the last century but for Edward Lear’s rather foolish creatures who embarked for exotic places in a rather comical way. We still had some unusual words to find (DITOKOUS for dropping two offstpring at once, PENK for a fish and RILEY, a US version of ‘ratty’) but slowly and steadily we completed our grid. What was left to do? ‘Lastly one normal entry must be changed to the thematic vessel.’ Well it’s staring me in the face isn’t it? SIEGE will convert to SIEVE. What comes next? ‘All final entries are real words or phrases’. I’d better check TIVES in the Big Red Book. I find ‘tav’ a letter in the Hebrew alphabet, and ‘tiv’ a member of a people living in SE Nigeria (that would give me TIVS) and ‘tivoes’ is recording a TV programme making digital recordings on a hard disc but no TIVES. Just a touch disconcerting. Of course I check the preamble (smile) – maybe there is a Poatish SINGE or LIEGE there that would change to SIEVE – but it was not to be. I believe Dysart has set a trap for the unwary. I wonder whether anyone will fall into it! There must be another word that we can change to SIEVE leaving all real words – and I don’t need to look far. LERNA produces CERUSE from CERULE, SERAPIS from SERAPES, ACKEES from ACKERS, and SHIES from SHIAS. Clever but just a mite sneaky, I feel. Thank you, Dysart for a great challenge.